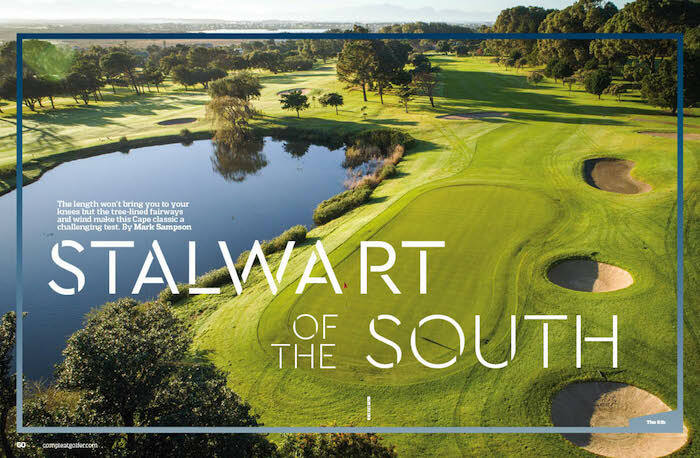 Westlake Golf Club’s length won’t bring you to your knees but the tree-lined fairways and wind make this Cape classic a challenging test, writes MARK SAMPSON in Compleat Golfer. Nestled under the Silvermine nature reserve mountain, Westlake sits on the edge of what is referred to as the ‘deep south’ of Cape Town, stretching from Muizenberg to Simon’s Town and beyond. The deep south is very much part of the history of Westlake as many of its founding members moved from Clovelly to establish the club on the ‘other’ side of the mountain. In the early-1930s the owners of the land on which Clovelly was situated were declared insolvent. Members made a bid to buy the land, but it was taken up by two entrepreneurs, Gus Ackerman and Michael Pevsner, who established the Clovelly Country Club. A large core of the club, 112 members, decided to move on and establish their own club. They came upon a farm, named Raapkraal, whose owner agreed to lease them a portion of land for nine years. A cottage on the land formed the first clubhouse for the Westlake Golf Club, established in March 1932. Only five months later a nine-hole course was opened to the public. As the club grew it was agreed to upgrade the course to 18 holes and architect Dr DC Murray was appointed to create the additional holes. At a smidgen under 5 700m, it is not much shorter than the majority of the Cape courses. But when there is wind, the tree-lined fairways can prove highly elusive. It is a shot-maker’s course with accuracy off the tees necessary all through the round. Find the fairway and a good score is on the cards; miss and big numbers will follow. As with all Cape courses, the wind always has a say on this stroke-69 layout. When it’s up, that 69 is a tough call and very few of the holes are not influenced by the south-easter howling around the mountain. A variety of pines and blue gums dominate the landscape. Bunkering, although not a feature of the course, is well placed, especially on some of the longer holes. Some of the more notable holes include the 2nd, 4th, 8th, 12th and 18th. The 2nd is stroke one for good reason. It plays directly into the prevailing wind, and at 352m – with massive blue gums on either side of the fairway – it requires accurate length off the tee and on approach. As the fairway bends from right to left, it narrows dramatically as you near the green, which slopes from back to front and is small in comparison to its 17 siblings. Its final protection is a small bunker front right. The 4th is a long, uphill par five needing good course management. Golf director at Westlake, Nic Lochner, gives us the inside information on page 66 on playing this stroke five. The 8th is an uphill par four with water protecting the green. At 287m it is short but there is much danger greenside. A well-struck driver will leave a wedge into the long, narrow green, which slopes from back to front. Three bunkers left and a water hazard right become a lot more noticeable when the wind is up. The back nine is much of the same with accuracy paramount from the get-go in the form of the 348m par-four 10th as it slides towards the hole with numerous water hazards as you near the green. The 11th and 12th play into the prevailing wind and are of similar length and difficulty. The 13th offers one of the genuine birdie opportunities, playing 429m. It is not long, but it does play directly into the south-easter. The small green is protected by two bunkers left. The two par threes on the back nine are contrastingly different although they both under 150m in length. The 15th is wide open with a massive surface and numerous bunkers, while the 17th is played through a chute of pines to a small, raised surface with no bunkers. The closing hole at Westlake is undoubtedly one of the most memorable. Not necessarily due to the fact it is the stroke two, but the massive trees that line the fairway are hard to forget. It slides from right to left, plays into the prevailing wind and the raised green is protected by three bunkers. The key is to stay on the right side of the fairway so as not to be closed off on the approach. Par on this 339m ‘monster’ is a great way to finish the round. Like most courses, Westlake has undergone numerous changes and upgrades, including alterations to the 4th, 7th, 8th and 11th green complexes in 2004. As the club has grown, so too has the clubhouse, with four upgrades in the past 20 years. Another interesting piece of history is the changing of the water supply which for many years was the so-called brown- water system coming off Silvermine reservoir. In 2006 the course connected with the effluent-water system from Steenberg Estate to allow for a fully reticulated water system and year-round good conditioning of the course. Testimony to the quality of Westlake Golf Club is the fact it has hosted numerous tournaments, from provincial to national. These include intervarsity tournaments, U23 interprovincial tournaments, Nomads nationals, SA amateur championships and Western Province amateur championships. More recently it hosted the Investec SA Women’s Open, and received rave reviews from players and the Sunshine Tour. More importantly, though, is its strong membership which always seems to be the flavour of the month among South Africa’s top sportsmen. Those who have walked its hallowed halls include Jacques Kallis, Dale Steyn, Faf du Plessis, Gavin Hunt, Jake White, Nick Mallett and Graeme Smith. Over and above that, the course and clubhouse are always a hive of activity with the patio and bar area abuzz with members not necessarily there to play but to simply to enjoy the atmosphere. It’s a course that ticks all the boxes, with easy access off the highway, year-round good conditioning and friendly, helpful staff making for a great experience.